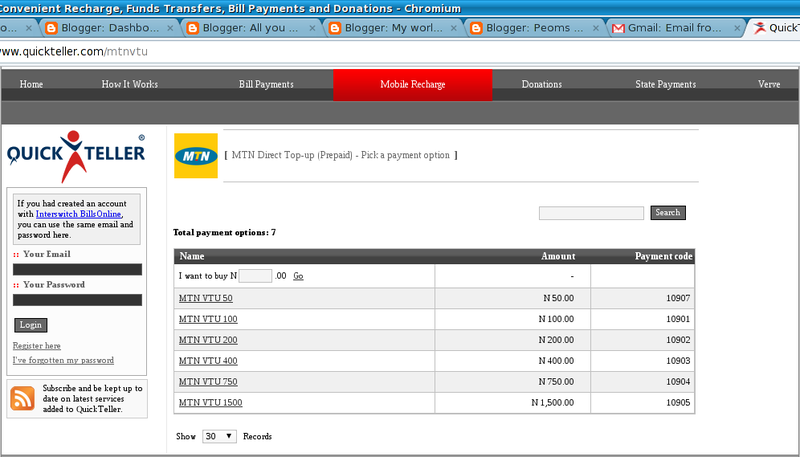 As you can see, right in the middle of the webpage there are links to recharge Airtel, Etisalat, Glo and MTN lines. And there are other links too -- pay AERO flight booking, DSTV & HiTV subscriptions, pay utility bills and do online shopping. But in this post, I'll show you how to recharge an MTN line. All you need is your ATM card details (including your PIN). As you can see, there are different recharge amounts and the option to specify the amount you want. 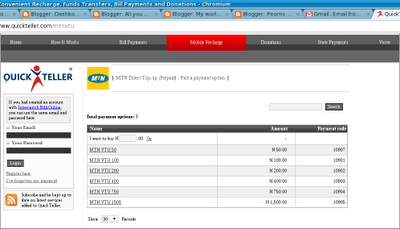 For this tutorial, I'll click on the MTN VTU 400 link. The following page will come up. You will be requested to login. Since you are (probably) a new user, you will have to create an account by clicking Register here in the lefthand box shown below. You will be presented with a registration form that requires your basic BIODATA and login details (see the snapshot below). You'll fill the form and click Register. Then you will be presented with the following page. Enter the MTN phone number you want to recharge and click on Next. Then you will be taken to a verification page, shown below. Verify that the phone number is correct and click on Pay. 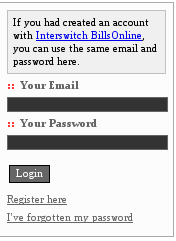 You will now be directed to the interswitch payment page (shown below). If your card is Verve (FirstBank, Skye & Oceanic ATM cards), select Verve but if it is MasterCard (all GTB ATM cards) select MasterCard. If your card is VISA (UBA ATM cards), I can't tell which option will be appropraite. 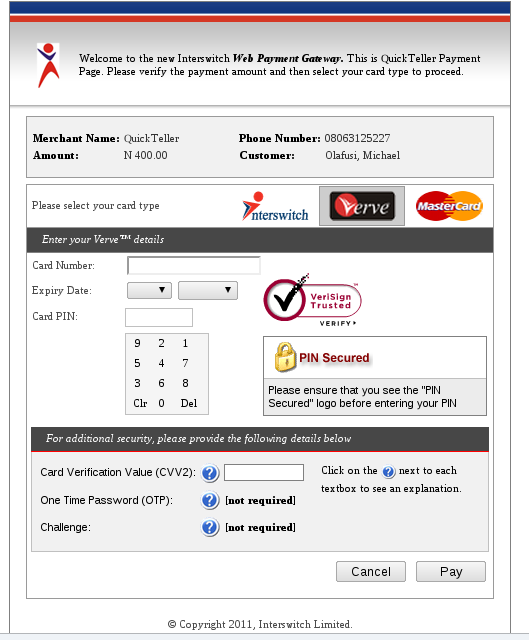 Enter your card number, expiry date and punch in the PIN number. Don't forget to enter the 3 digits number at the back of your card as the Card Verification Value (CVV2). 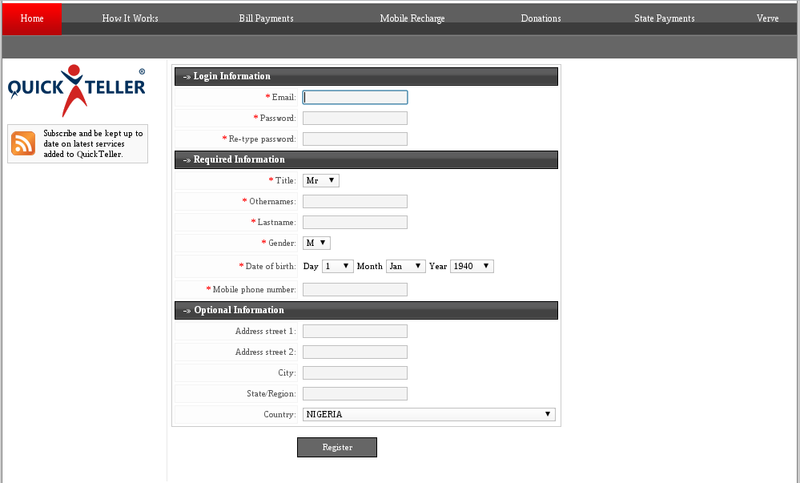 Click on pay when you are sure you've provided the correct details. Wait a few seconds for your transaction to be processed and a notification/receipt page will come up. Voila! You have successfully recharged your phone right from the comfort of (the front of) your computer. Thanks for reading my post and if you are stuck anywhere, feel free to tell me via a comment. Don't forget to subscribe and receive useful tips via e-mail. I REALLY LIKE THSI IDEA AND HAVE REGISTERED BUT MY CHALLENGE IS THAT I USE VISA CARD. DOES IT MEAN I CAN'T MAKE PAYMENT WITH THIS CARD? WHAT AM I TO DO? Hello, you might have to use your banks mobile application to recharge your phone. What bank do you use, I might be able to guide you on the how-to. For example, UBA hase Umobile. Hello Alishas, unfortunately, none of the available sites accept international debit card. You'll have to stick to buying the recharge vouchers. Hi hohn, when last did you try paying with your Nigeria MasterCard? I recently used my GTB Nigeria MasterCard and it worked. 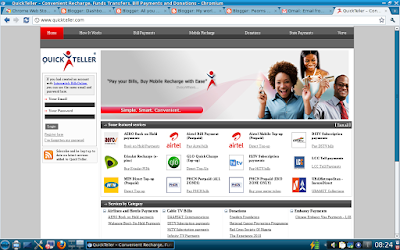 I use Chithub.com to buy recharge cards online using my ATM card....its instant and does not require registration. you an Internet Banking Hardware Token. 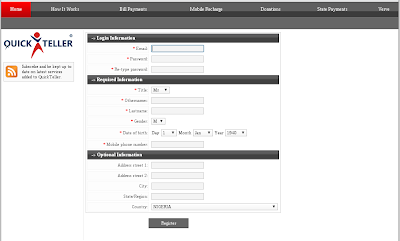 gives you an additional security while making any online payment transaction. transaction will not scale through. Hi Desmond, thanks for your comment. I checked the Chithub.com site and it looks quite genuine. And considering that you've actually used it before, now thatz good PR. Hi TJ, I didn't go through any of the process you listed in order to use my GTB card online. As long as you have a GTB card that can access your account from any bank's ATM, then it could be used for online payment without any extra step. Hi mhoo, this is quite saddening. 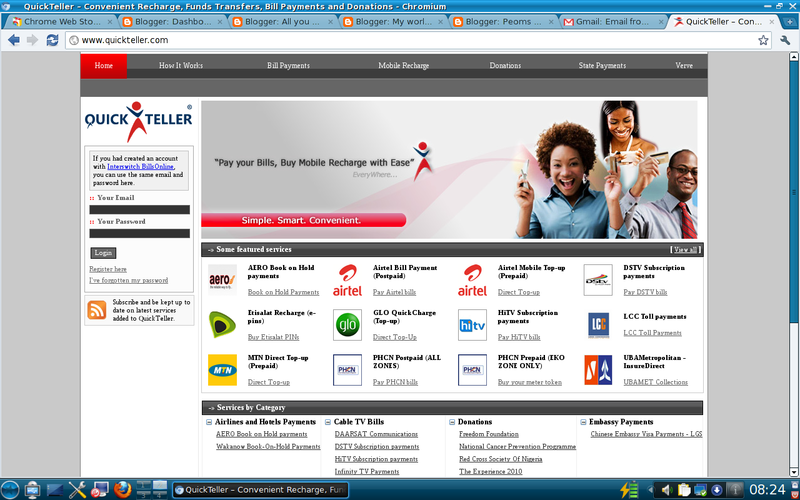 Really, I have been paying my Airtel postpaid bill via Quickteller with my GTB Card for over 6 months now (and monthly). I even recently made a payment last week Friday (same Quickteller). What errors do you get? Or does it just say transaction declined? I am hardly online these days. If you can beep me on 08089382423, I will be willing to call you back and put you through the very steps I take in paying via Quickteller. I have downloaded the Quickteller app on my fone but can't recharge cos it's telling me no aaccounts found. I have also registered my atm card at an atm machine. What can i Do? I'm sure this will help as I saw a section on recharging your phone. Hi Wale, most ATM cards need to be activated for online transactions. Have you contacted Skye bank? 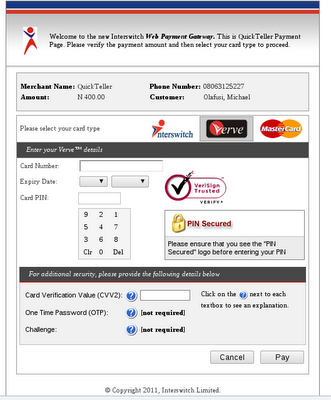 I use VISA and my bank is Fidelity and I am wondering how I can buy VTU with this card??? Now, that's an issue I have no answer for (now). I'll try to get you a valid answer. Most banks are now enable customers to use short codes to purchase airtime, very soon quickteller may be used for other purposes but not for buying airtime.